Outside my window there are fresh fox trails in deep snow. It’s surely Winter time still, and yet there is a sense of rising energy as ideas and visions begin to manifest. Preparations must be made for the year ahead. Buds are forming on trees and the birds call forth the season’s change. The natural world can appear quite barren at this time. My years of conditioning certainly had me believe that this is so. As such, on Winter walks I’d cast only a cursory glance at the carpet of debris beneath me. I’d pass by the skeletal remains of glorious umbels on stalks towering high above the leaf litter, perhaps pausing momentarily to admire their beauty. Now to me these hollow structures serve as messengers whispering the promise of new life and tender young edible shoots. Foraging for food, getting to know plants intimately throughout the seasons, has led me to experience the world differently. Looking for, often very subtle clues in nature, I’ve learned to view things on the micro as well as macro scale. 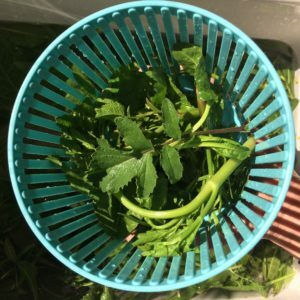 Regularly foraging and consuming wild food you can’t help but become more attuned to your environment. This simple act is quite profound in the way it connects us with the earth, giving a sense of being rooted in the place we live. As I walk my breathing deepens and gradually I come to my senses. Thoughts quieten and my being expands to meet the surrounding landscape. I am drawn this way and that, until finally my feet come to a standstill. I am not sure why but it feels like this is the place to be right now. Then my attention is brought to a plant or mushroom and there’s a sense of magic and aliveness as we meet. Next follows a spark of inspiration for some wild food creation – A soup, salad, herbal infusion, tincture or perhaps a seasonal ferment. 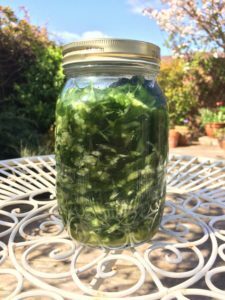 Fermenting and wild food really go hand in hand. The freshest leaves, shoots and bulbs are carefully selected and foraged. All this goodness is then not only preserved but is miraculously transformed by bacteria, fungi and the enzymes they produce during the fermentation process. Minerals become more bio-available, nutrients are enhanced and complex, wonderful flavors develop. Our job is to set up the right conditions for this transformation to take place. We are invited to slow down, let go of the desire to be in control and “touch the process” – To listen to the environment, taste as we go, adding a little of this and a little of that, a pinch of salt at a time. It’s alchemy and requires a high degree of presence, of feeling into what is needed in each moment. Fermenting is more of an art than a series of rules to be followed and every time the set of circumstances is completely unique. Over the coming weeks, nature’s wild offerings may include hairy bitter cress (neither hairy nor bitter! ), alexanders, winter cress, jack by the hedge, wild garlic shoots, cleavers, black mustard and crow garlic. A winter meets spring ferment. Wash and chop your ingredients then place in a large mixing bowl. Add a little salt and mix the contents with your hands. Taste to see if more salt is required. 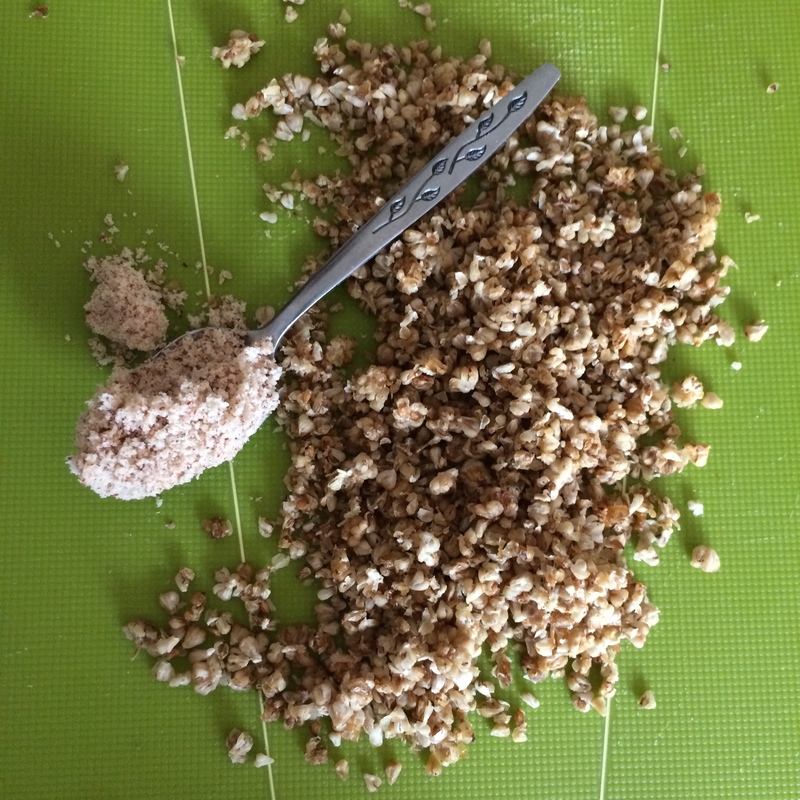 Carry on gradually adding and mixing like this until it tastes about right – Salty but not unpalatable. There needs to be enough salt to prevent aerobic fermentation by airborne bacteria. Next, leave ingredients for 20 minutes or so, during which time the salt will start to bring out the juices from the vegetables. Massage them to further help this action, then transfer into a large, wide necked jar (sterilised). Push contents down as much as possible using your hands or a rolling pin then place a weight, such as a jar filled with water with the lid on, inside your main jar. This is to weigh the vegetables down so that they will become submerged in salty brine. Once fermentation starts taking place (usually after a day or so) the brine level will rise to cover your vegetables. If after a few days this hasn’t happened you can add a little mineral water to bring the level up. 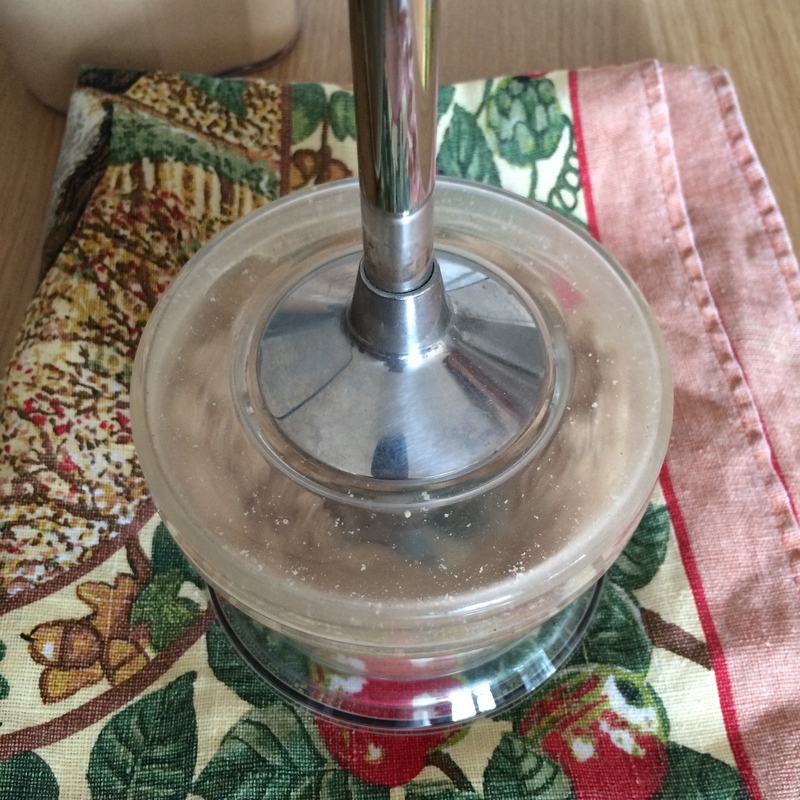 It’s worth placing a tray or saucer under the jar as there may be some overflowing. Sample the kraut regularly and when it tastes good to you (probably after around a week) remove the weight, pop a lid on the jar and store in the fridge. It will keep for weeks or even months. A precautionary note: Only pick and consume wild plants if you are one hundred percent certain you can positively identify them. Also, with any new food, air on the side of caution, trying only a small quantity to begin with. This is a hit with virtually everyone. I don’t remember where I originally got the idea from but in recent years it’s spread throughout the foraging community like a patch of wild garlic in your local woodland. Very simple, very delicious! Pick or snip a couple of thousand wild garlic seeds (or as many as you think you’ll want to eat). Wash and snip the seeds off, cutting through those umbels above the main plant stems. Don’t worry too much about removing those little stalks attached to the seeds, they’ll pickle nicely. Lay seeds out to partially dry. Add seeds to a large jar and salt generously. Leave in the fridge for about a week then top up with apple cider vinegar. Place back in the fridge and leave for at least a few days to pickle (I’ve left for anything up to about two weeks and it’s been fine). Strain the vinegar (keep this to use in salad dressings etc as it’s tasty and extremely good for you). Top up your jar of pickled seeds with olive oil. Store in the fridge and enjoy. Pickled garlic seeds in action on a spring foraging walk in Somerset. They’re a condiment I bring along to virtually all my foraging walks and courses. Wild Garlic is wonderful and abundant in most parts of the UK (in Cornwall less so but there you have the equally versatile and delicious Three Cornered Garlic). 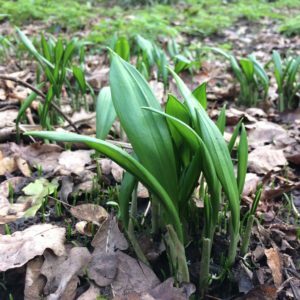 Wild Garlic seeds, flower buds, flowers, bulbs, leaves and leaf stalks can each be used in so many ways – really, your imagination’s the limit. At the time of writing it’s early May and Wild Garlic leaves are starting to look a bit tired so don’t hang about if you’ve yet to make pesto! Unopened flower buds can be added to ferments or pickled and flowers provide the perfect garnish to many meals. 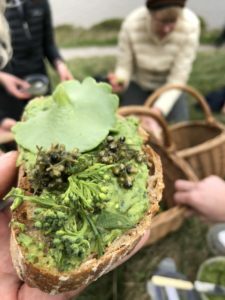 When petals wither and drop off we’re gifted one last crop: the much overlooked seeds – nibbled raw, added to risottos or pickled (vegan caviar) they are truly wonderful so don’t miss out on the fun! 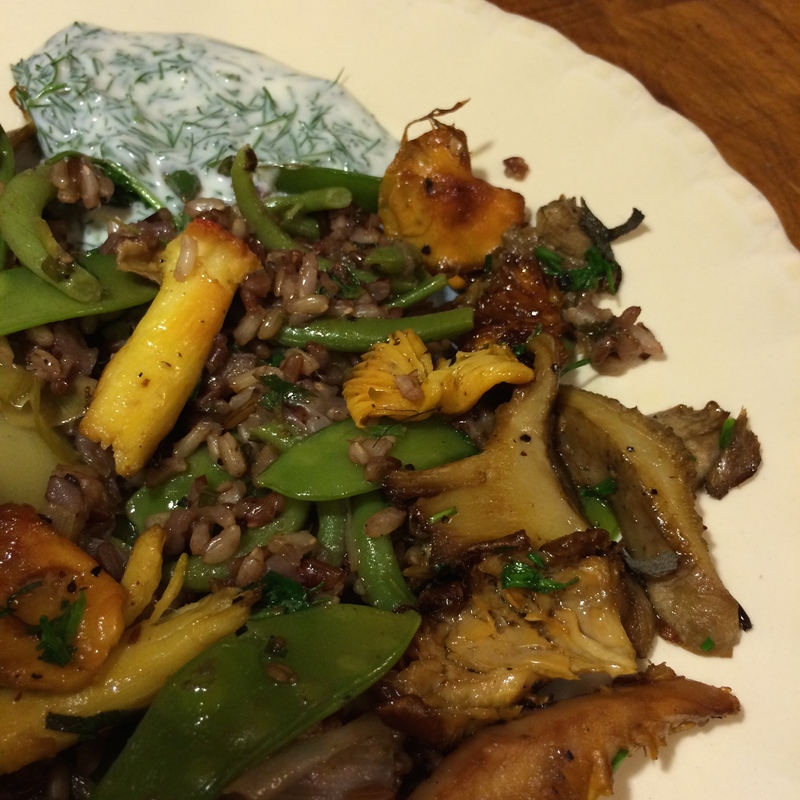 Here’s my recipe using Wild Garlic leaves, seeds and flowers. Any combination of these ingredients will work. Forage your garlic leaves, flowers and/or seeds. I use a scissors to snip the seeds from their stalks. You don’t have to be too precise as the stalks are edible and will soften when cooked. 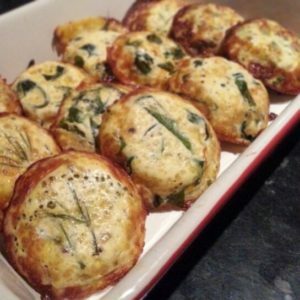 Add some Wild Garlic flowers/seeds/leaves to greased cupcake trays. Cook on gas mark 140 for around 15 to 20 minutes or until your frittatetes are firm on top and starting to brown. Serve with a wild leaf salad and your favourite dressing*. 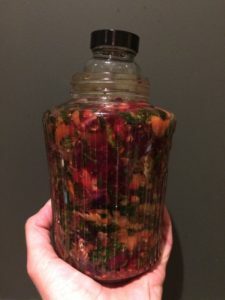 *You can make your own wild flavoured vinegar for salad dressings by simply adding flowers to vinegar and leaving for a week or so before straining and bottling. Hawthorn blossom, Rose petals, Elderflowers and Dandelions all work well but there are lots of other possibilities. Fermenting is highly addictive and very good for you. It’s also very easy to do – requiring just the vegetables of your choice, salt and time. 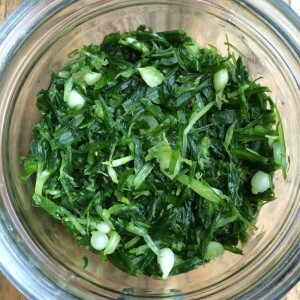 Adaptable to your whims and to whatever happens to be in season, fermenting is an age old means of preserving gluts of certain things so you can be enjoying spring ingredients such as Nettles and Wild Garlic throughout the summer and eating Rock Samphire and other coastal delights well into autumn. The fermentation process relies on the action of Lactobacillus bacteria that live, breathing anaerobically, in the salty brine, and, through time transform ingredients into complex and wonderful new flavours. With probiotic goodness, eating fermented food is highly recommended for health. I was a self-confessed chutney addict until I was introduced to kimchi and now, instead, I enjoy this with most meals. Traditional Korean kimchi varies a lot. A simple version might include napa cabbage, daikon radish, onion, scallions, ginger, garlic, gochugaru (Korean red pepper chilli flakes) and maybe carrot. Kimchi often contains shrimp paste or fish sauce which helps give depth of flavour, however I think the vegan friendly version that I dish out on all my spring and summer walks is just as good. I haven’t included quantities here – just mix up ingredients in your bowl and let your instincts guide you. For me, once the colours in my mixing bowl balance, I know that kimchi is going to work. 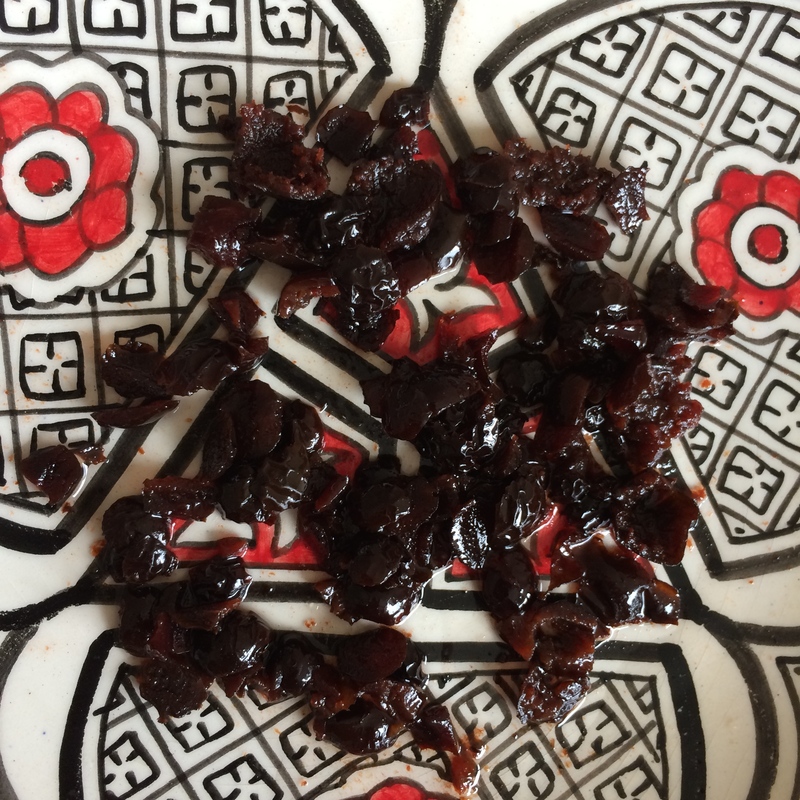 I still taste as I go – too much salt (see description below) or hot chilli flakes could spoil a batch. Wash, spin and chop your ingredients then place in a large mixing bowl. Add a little salt and mix the contents with you hands (you may want to wear gloves). Taste to see if more salt is required and carry on adding and mixing like this until it tastes about right – salty but not unpalatable. Basically, there needs to be enough salt to prevent rotting and bear in mind that the saltiness will lessen with time. Next, leave ingredients for 20 minutes or so, during which time the salt will start to bring out the juices from the vegetables. Massage them to further help this action, then transfer into a large, sterilised jar – I find it best to use a wide necked type, because it makes it easier to keep your kimchi submerged, which is the next step. Push contents down as much as possible using your fist then place a weight, such as a jar filled with water, the lid on, inside your main jar. This is to weigh the vegetables down and keep them submerged. A certain amount of fiddling is often required to get this right. Once fermentation starts taking place (usually after a day or so) the brine level will rise. You may need to adjust your weight and perhaps remove some of the brine to prevent overflowing in these early stages of fermentation. Don’t discard any spare brine as you can add it back to the jar if and when levels fall – this usually happens to my ferments later on when they are in the fridge. I hope this doesn’t sound too complicated- it really isn’t and you’ll find your own way with it. The important thing is to keep kimchi submerged to prevent mould forming. That’s really the only thing that can go wrong and you’ll know if this happens as it will smell ‘off’. After around a week remove the weight, topping up with water if needed. Pop a lid on the jar then store kimchi in the fridge. It will keep for weeks or even months, the flavours evolving as time goes by. Every batch is slightly different and this is why it’s so exciting! Spicy flavours will definitely mellow so I like to make kimchi with a fair amount of chilli powder and at least one whole fresh chilli. The gochugaru chilli powder provides flavour rather than heat so don’t be shy with this either. Really you just need to get involved and you’ll find your own preferences when it comes to method, quantities and ingredients. The process for these ferments was the same, only, with just one wild ingredient. These are quicker to make than kimchi and you’ll get the flavour transformation of that particular ingredient. Nettles can be made into pesto and fermented Wild Garlic is REALLY good on sourdough bread with Wild Garlic pesto and some strong cheddar cheese. 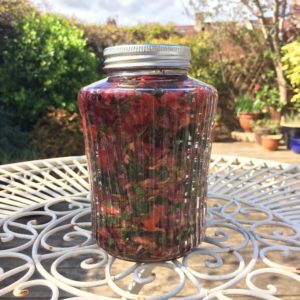 These are just a few ideas to get you started – you can make delicious ferments from all sorts of shop bought, home grown or wild foraged ingredients. Enjoy! 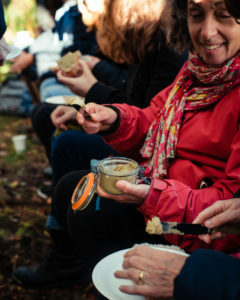 I’m often asked, on my walks how I’ve made the things I bring along for people to try- mushroom pâté, picked seeds, wild kimchi and warming soups are some of the favourites. Here’s the recipe for a very tasty soup I’ve been dishing out during the colder months. It’s different every time, depending which leaves I’ve foraged that day. I added some favourite dried ingredients and just played with the flavours, following my instincts. Whoever said don’t play with your food? Feel free to adapt this recipe according to what you have at hand, wild or bought. I don’t recommend picking Wild Chervil AKA Cow Parsley or Alexanders unless you know the carrot family very well- you might instead use Parsley and Celery. Lightly sauté your onions for a few minutes then add potatoes. Add water and stock, turn up the heat to bring to a boil, reduce heat and simmer until the potatoes are getting close to cooked. At this point add your chopped Garlic, Nettles and Alexanders then cook for few minutes more. 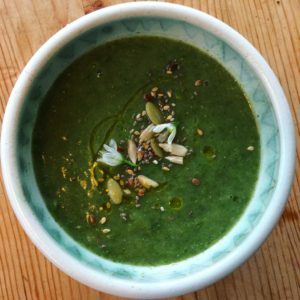 Allow to cool then whizz soup with a handheld blender. Reheat and add more miso paste if required. Serve in pretty bowls with any or all of the suggested toppings. I’m posting this recipe due to popular demand. It’s simple and easy to make as well as being versatile- whichever mushrooms you happen to have will work, although my favourites for pâté are Ceps and Bay Boletes. It’s a great way of using up older, perhaps less attractive members of your collection and if you don’t have any wild mushrooms, shop bought ones will do just fine- simply ask your local greengrocer for half a kilo of Agaricus Bisporus! Try spreading pâté on toasted sourdough with some soft goat’s cheese and kimchi… For vegan pâté, simply leave out the butter. It will still taste great! Heat a wide based frying pan, add a glug of olive oil and a knob of butter (if using). Fry your mushrooms for longer than you usually would then add some stock. I use either powdered mushroom (cep) stock or Bouillon stock. Continue cooking for another 5 or 10 minutes then add wholegrain mustard. 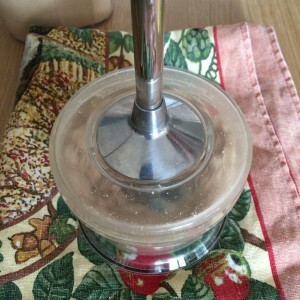 Take off the heat and blend to a smooth consistency (I personally don’t like lumps in my pâté) with a hand held blender. 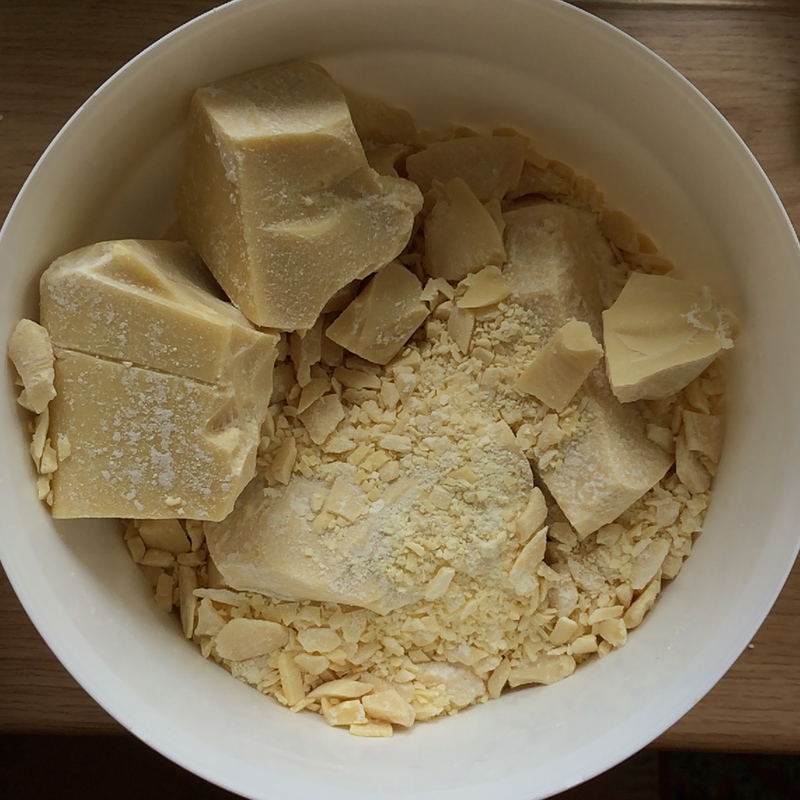 Then, while the mixture is still hot, fold in the rest of your butter, put back on a low heat and stir for a minute. Take off the heat and blend again. Spoon into sterilised jars. Replace the lids, then leave for a few hours to cool. Label your jars and store in the fridge. Your pâté will keep for a few months, in theory, although I don’t think it will last this long once you have tasted it! Rice, roast veg and mushrooms with dill and saffron yogurt. Rice cooked with star anise and fennel, roasted vegetables, chestnuts, mange tout and last of the garden beans. Wax Cap mushrooms sautéed with thyme and sage, then further cooked with Elderberry vinegar. To accompany: Kefir yogurt with dill and rose water. This was one of those unplanned meals that evolved from what I had in the store cupboard, plus what I had foraged that day. I’m sharing because it worked well and I thought the colours looked great! Starting with a base of mixed camargue, wild and long grain rice, I then added everything else, tasting as I went along. N.B. 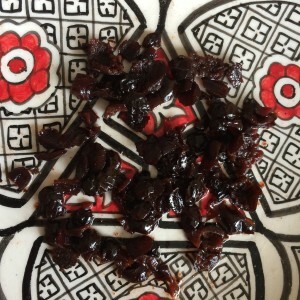 I had previously been marinading beefsteak fungus in my Elderberry vinegar. The vinegar tasted fantastic so I used in this dish- I think it could have been great added a mushroom risotto too! A balsamic glaze would work really well if you don’t have Elderberry vinegar. Firstly I added olive oil to a large frying pan, turned on the heat and sautéed my onion for a few minutes. I then added the rice, fennel and star anise, stirring for a few more minutes, before pouring in the stock (making sure the liquid level was around a centimetre above the rice). Next I placed the lid on the pan, turned the heat down about as low as it would go and cooked the rice for thirty five minutes. Meanwhile, in a separate, frying pan I cooked the mushrooms in olive oil and butter, adding some seasoning. I combined the rice with the mushrooms and added to a large, heavy based cooking pot, along with a glug of olive oil. Turning to a low heat, I stirred in the roasted vegetables, beans and mange tout (having steamed and strained the beans). I then added mushrooms, Chestnuts, herbs and vinegar and further cooked for ten minutes. To accompany the meal, I mixed together yogurt, rose water, a pinch of salt and freshly chopped dill. N.B. for Elderberry vinegar recipe see my fruit vinegars post. Delicious and healthy chocolates- the perfect snack to take on those Autumn mushroom forays! 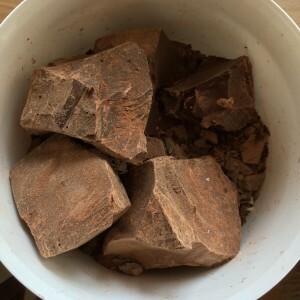 Raw cacao contains bitter tasting flavonols – a class of flavanoids antioxidants with anti-inflammatory properties. Lucuma is gluten-free with essential trace elements, fibre, vitamins and minerals… And coconut butter contains potassium, magnesium, and iron plus has anti-microbial properties. Suffice to say the berries and nuts are very good for you too! 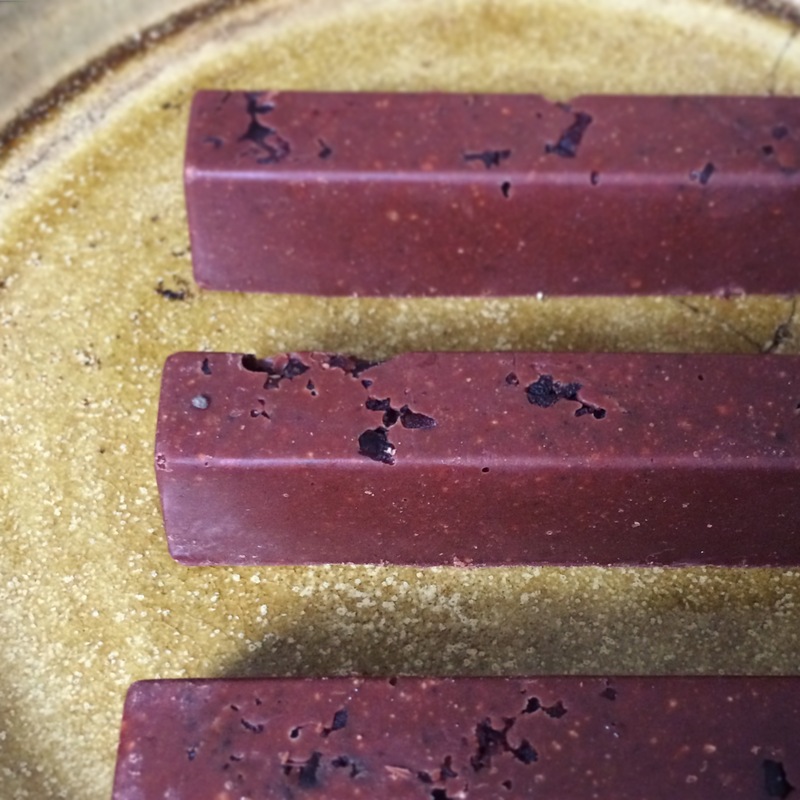 The non-foraged ingredients in this recipe can be found in most health food shops. Note: You might try adapting this recipe, adding Meadowsweet pollen or substituting Sloes for Sea Buckthorn berries. A medium sized saucepan for your bain-marie. A second, slightly smaller pan. Pour hot water into the saucepan- enough so that it does not spill over the sides when you add the second pan to the saucepan or bain-marie. 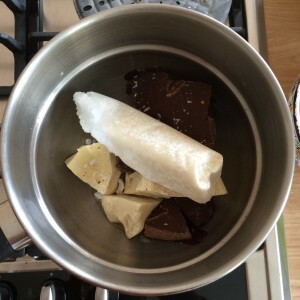 Add the creamed coconut butter, lucuma, cacao paste and cacao butter to the second pan, then place this in the bain-marie. Let the ingredients melt, without putting a lid on the pan. This is to avoid condensation (you do not want water in your mixture as fat and water do not mix). 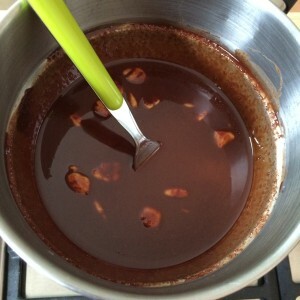 Keep the mixture over the hot water as you prepare the other ingredients. Chop the Mulberries and gin soaked Sloes and whiz the Hazelnuts. Add these ingredients to the mixture once it is melted and stir. 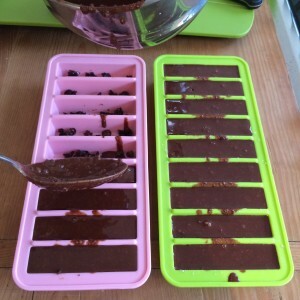 Finally spoon the mixture into your moulds and very carefully put in the fridge. Leave to set overnight. 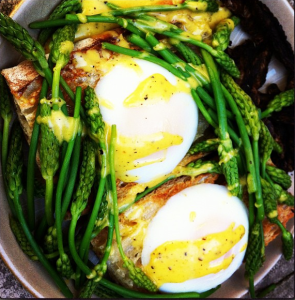 Wild Asparagus: Verging on perfect! 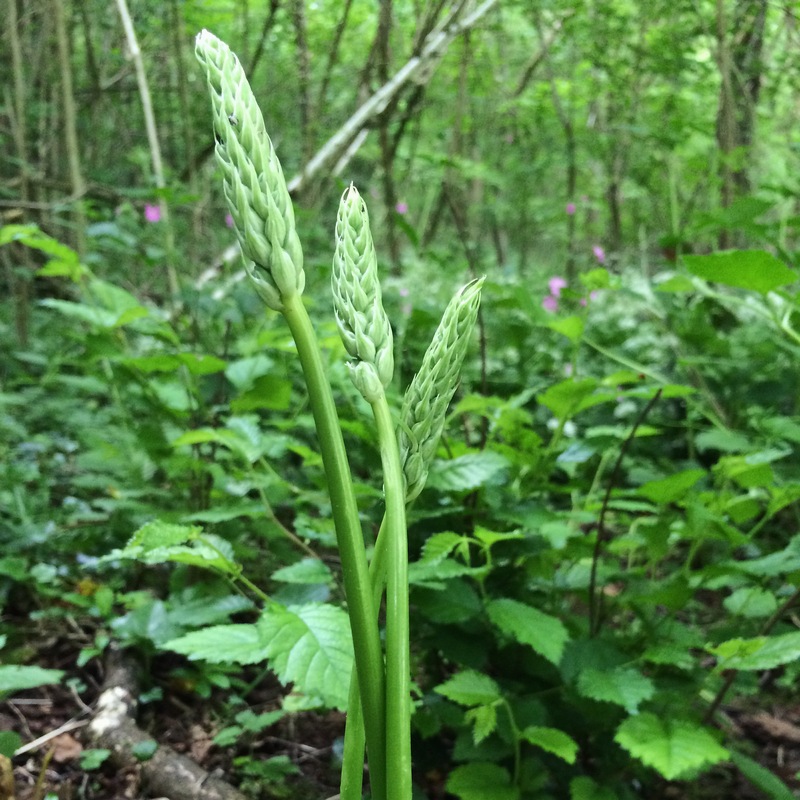 Bath Asparagus, Ornithogalum pyrenaicum grows in scattered pockets along the hedgerows of country lanes near Bath. It also exists in more expansive colonies in certain woodlands thereabouts. Thought to have been a Roman import, the plant has flowers that give rise to it’s other name: The Spiked Star of Bethlehem. Though a protected species, the tasty young flower buds and stalks are often cut down in their prime by the dreaded hedge strimmers – this green roadkill then makes for a delicious meal! My favourite thing to do with this wild vegetable is to steam it for a few minutes, season then add a squeeze of lemon juice. For a breakfast to remember, serve it on sourdough bread with hollandaise sauce and poached duck eggs. This year, with the late season for St George’s mushrooms I might make a mushroom and asparagus risotto- the taste of Bath Asparagus is less strong than it’s cultivated cousin, so it won’t overpower the flavour of the mushrooms. 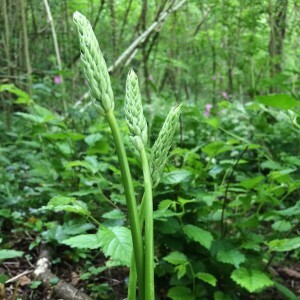 Bath Asparagus growing in woodland near Bath. The young shoots and green flower buds of Common Hogweed Heracleum sphondylium are one of our best wild vegetables. 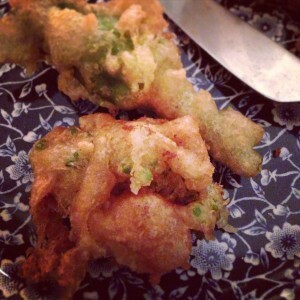 They are fantastic in risottos, fried in coconut oil and eaten as a green or as tempura (see picture and recipe below) As well as this, being a cut and come again vegetable, you can enjoy harvesting from the same patch for weeks on end. Some caution needs to be taken as the sap from the plant can cause phytophotodermititus; a burning of the skin, when exposed to sunlight. For this reason gloves should be worn when picking and the plant should not be eaten raw. Take care not to mistake Hogweed for its relative: Giant Hogweed, which has more serrated leaves and a purple, blotchy stem. Another, deadly member of the carrot family is Hemlock and eating just a small amount of this plant can be enough to kill you. You really need to be 100% certain you can identify plants in this family before consuming any of them. I’ll write more about the carrot family soon but for now I recommend going out with an experienced guide who can show you what to look for. There’s some excellent reference books out there, including Miles Irvin’s Forager’s Handbook with silhouette images of plants (good for pattern recognition) and useful descriptions of the characteristics of different species. This is a lot of fun to make, utterly delicious and you will love some of the alien-like shapes which manifest. 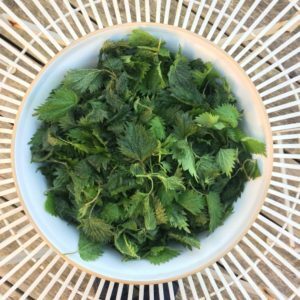 Like a lot of my favourite recipes, it works well with various ingredients; Nettle leaves, Wild Garlic seed heads, Ground Ivy leaves, Oxeye Daisy leaves and flowers… to name but a few. Sift flour, egg and salt into a bowl. Whisk in the water, but don’t over beat as you want the mixture to be light and fluffy. 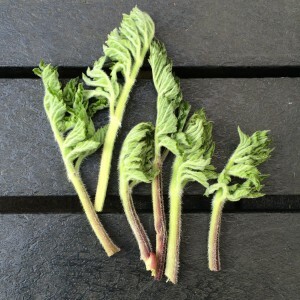 Coat the Hogweed shoots and flower heads then deep-fry in batches.